Queen’s musical, “We Will Rock You”, is set to close in London on May 31st after a 12-year run. 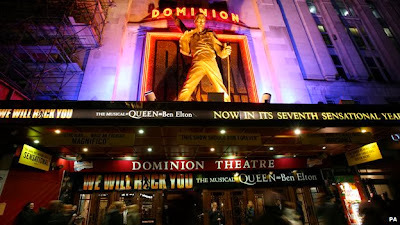 The show has played to more than 6.5 million people at London's Dominion Theatre, where it is the longest-running show at the venue and one of the Top 10 longest running musicals of all-time in the city’s West End. When it close, “We Will Rock You” will have been performed 4600 times at the Dominion. In addition, the musical has now been performed in 28 countries around the globe, and has been seen by a more than 16 million people. Theatregoers Choice awards presented by whatsonstage.com, including Best New Musical. In 2011, nine years after the curtain first went up, the show won the prestigious Olivier Audience Award, the only category voted for entirely by the public. The show went on to win a number of international awards for productions around the globe. Queen and Adam Lambert announced a 19-date summer tour of North America last week, with shows set to begin June 19 in Chicago. More details about the tour can be found here.